Hollyburn Country Club, West Vancouver (July 28 - August 5) - Philip Bester of North Vancouver, above, was the only BC tennis player playing in the main draw of this year's Vancouver Open Men's Singles event. 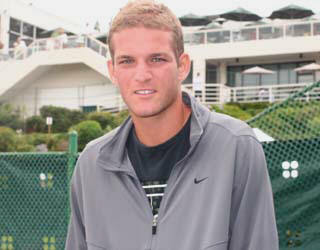 Philip was the boys singles finalist at 2006 French Open. He has teamed up with Canadian Peter Davidson for the main draw of Men's Open Doubles. Philip lost in a very close match to South Africa's Rik De Voest (ATP No.125), the winner of last year's event, 6-2, 4-6, 7-5, in the first round of the Open. Photo 1 (left): Stefi Gjine and her father Artur. Stefi, winner of last week's Stanly Park Open Women's Singles, and Rebecca Marino of Vancouver, who won back-to-back Stanley Park crowns in 2005 and 2006, were given wild cards to play in the main draw of the Women's Singles at the Open. Stefi went to lose to Takagishi of Japan, 6-4, 6-0, in the first round and Rebecca lost to American Abigail Spears (No. 152), 6-2, 6-3. Photo 2: Kamil Pajkowski lost in the first round of qualifying event to Henry Choi, 4-6, 6-1, 6-3. Henry lost his second-round match later that day to American Roman Browvanov (No.404), 6-1, 6-2. Photo 3: Graeme Kassautzki of Vancouver lost in a heart breaking match, in the first round, to Mexican Luis Manue Flores, 6-2, 4-6, 7-5. Photo 4: Sixteen-year-old Vasek Pospisil of Vernon, winner of this year's ITF event, won a set from No. 367 in world ranking, Australian Colin Ebelthite, before going down in three sets, 6-3, 2-6, 6-2. Colin later, secured a spot in the main draw. Vasek teamed up with American Adam Davidson for the Men's Open Doubles. The pair, later, lost, in the first round, to Philip Bester and Canadian Peter Polansky, 6-2, 6-3. Photo 5: Jeremy Salvo lost to Australian Danilc Zivanovic, 6-4, 6-3. Photo 6: Justin Kates had to play two matches on Saturday beating Canadian Kikita Tchernikov, 6-3, 6-0, in the first, but then falling 6-0, 6-1 to American Phillip King, No. 415 in world. King, later secured a spot in the main draw. Carl Ho, the winner of BC Junior Provincial Championships, lost to American American Patrick Briaud, 6-1, 6-3. Patrick Flint of Victoria came out on top in his first match - against Japanese Tetsuo Uchino, 6-1, 6-1, but lost his second match, later that day, to American Nikita Kryvonos (No.4438), 6-0, 6-2. Nikita Kryvonos went on to secured a spot in the main draw. T. Du Toit, runner up of this year's ITF event, on the women's side, lost to Russian M. Gaverova, 6-3, 6-0.